In Thailand it is said that the number of flowers on a Euphorbia crown of thorns plant foretells the luck of the plant keeper. Over the past 20 years, hybridizers have improved the plant so that it produces more and larger flowers (and if the saying is true, better luck) than ever before. In the right setting, hybrids of Euphorbia (crown of thorns) bloom almost year round. 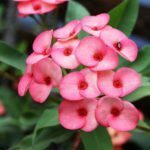 If you’re looking for a plant that thrives in the conditions inside most homes, try the crown of thorns plant (Euphorbia milii). Growing the plant is easy because it adapts well to normal room temperatures and in dry indoor environments. It also forgives occasional missed waterings and feedings without complaint. Crown of thorns houseplant care begins with placing the plant in the best possible location. Place the plant in a very sunny window where it will receive three to four hours of direct sunlight each day. Average room temperatures of between 65-75 F. (18-24 C.) degrees Fahrenheit are fine. The plant can withstand temperatures as low as 50 F. (10 C.) in winter and as high as 90 F. (32 C.) in summer. From spring through late fall, water the crown of thorns plant when the soil is dry at a depth of about an inch, which is about the length of your finger to the first knuckle. Water the plant by flooding the pot with water. After all of the excess water has drained through, empty the saucer under the pot so that the roots aren’t left sitting in water. In winter, allow the soil to dry to a depth of 2 or 3 inches before watering. Feed the plant with a liquid houseplant fertilizer. Water the plant with the fertilizer every two weeks in spring, summer and fall. In winter, dilute the fertilizer to half strength and use it monthly. Repot the plant every two years in late winter or early spring. Crown of thorns needs a potting soil that drains quickly. A mix designed for cacti and succulents is ideal. Use a pot that is large enough to accommodate the roots comfortably. Remove as much of the old potting soil as possible without damaging the roots. As potting soil ages, it loses its ability to manage water effectively, and this can lead to root rot and other problems. Wear gloves when working with crown of thorns. The plant is poisonous if eaten and the sap causes skin irritations. Crown of thorns is also poisonous to pets and should be kept out of their reach.